I recently read about spatchcocked chicken in a magazine and knew I had to try it. Spatchcocking is more of a method than a recipe. To spatchcock a chicken all you do is place the whole chicken breast side down and, using kitchen shears, cut out the backbone. Start on the side of the backbone and cut up the side of the bone. 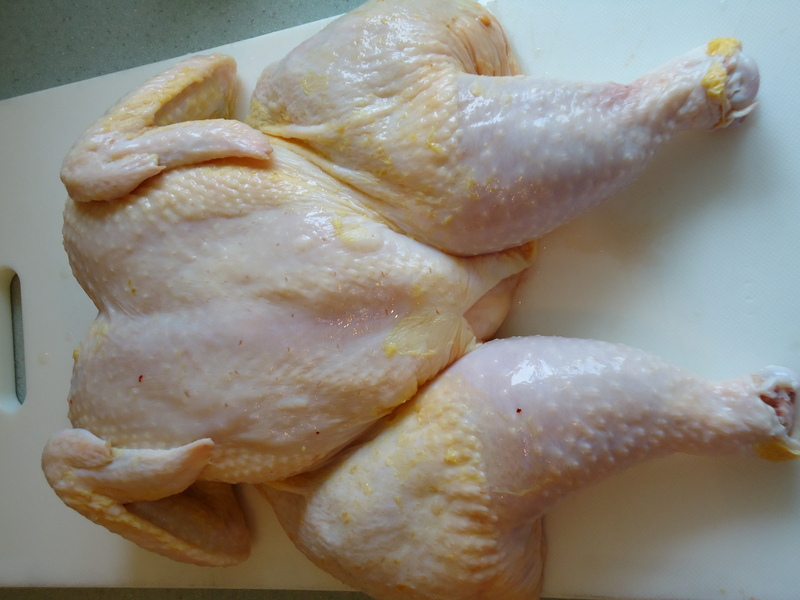 Once that is done, turn the chicken around and cut up the side of the backbone to remove it. Once the backbone is out, clean out the inside of the chicken and pat dry. Place chicken, breast side up, and gently press on the breast bone to flatten the chicken. Now you are ready to roast the bird. Place chicken in roasting pan. Surround with potatoes and carrots. Season all with salt, pepper and minced garlic. Drizzle chicken and vegetables with olive oil, about 2 tablespoons. Pour vegetable stock in bottom of pan. 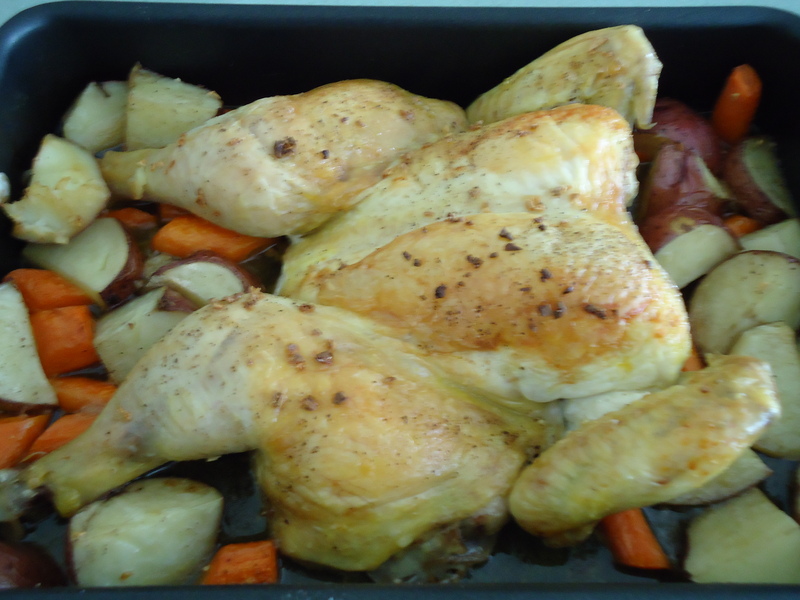 Roast chicken at 350 degrees F for 1 hour to 1 hour and 15 minutes. Remove from oven and let rest for 5 minutes before serving. Serves 4 – 1/4 chicken each. If you want to try spatchcocking, it’s really easier than you think. If you’ve ever cut up a whole chicken, you can cut out the backbone. This chicken cooked evenly and a more quickly than roasting the whole bird. Feel free to add veggies you like. You could certainly use fennel, quartered onions or sweet potatoes. This dinner reminded me of fall. My family was pleasantly surprised with the meal and I know it will be a favorite for years to come. I also served a recipe I got from Ina Garten, The Barefoot Contessa, for zucchini pancakes. Look for that post soon! This entry was posted in Chicken, Comfort Food, Company Worthy, Entertaining, Sunday Dinner and tagged baked chicken, chicken, chicken and vegetables, roast chicken, spatchcocked chicken. Bookmark the permalink.